Our CSA starts this Thursday, and I anticipate it being the high point of my week. To give you an idea of what my last week has been like; my pastor from Hawaii passed away, my grandmother had to be rushed to the ER twice, my grandparents need to be forced into assisted living, we had to confront one of our students living with us and give him an ultimatum, and we found out our cat Cappucino has pancreatitis and FIP and will need to be put down today or tomorrow. This is all in the midst of working and teaching cooking classes. So picking up our CSA box and getting to see our dear friends who own the family farm will be a huge blessing of something positive in the midst of a difficult time. It’s hard to believe I’m still blogging during all of this, but in some ways it’s what’s keeping me sane! I haven’t really had time to do anything in the garden the last few weeks, but fortunately it’s at the point where it doesn’t need much from me right now but some watering. My peas are climbing my homemade trellis and I hope they’ll start flowering any day now. My lettuce is growing nicely and Chloe our bunny has already given it her vote of approval. I got my first strawberry last week, an early ripening variety. This spring I dug up all my strawberry plants that were growing in the backyard when we moved here. Last year they were all eaten by bedbugs so this year I’m trying some in pots. 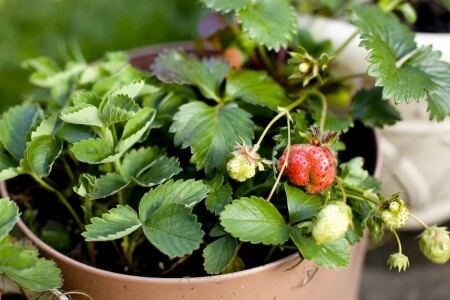 I also plan to build a special raised bed just for strawberries at the side of my house and see which do better. One edible I’ve planted that’s doing amazing is my radishes. 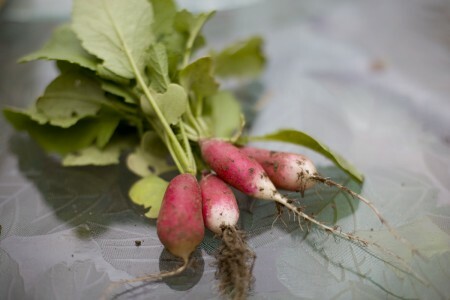 They’re French breakfast radishes and grow so fast, that if you’re a beginning gardener like me, they’re a very rewarding crop. 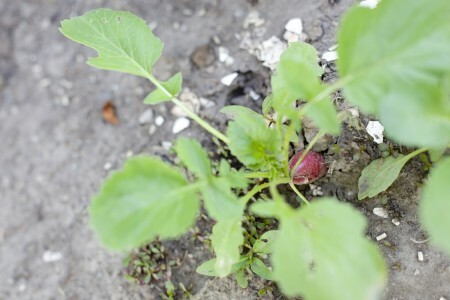 Everyone told me that radishes are worm food, apparently there are little white grubs that love to munch them. So far this seems to be the one and only bug problem I don’t have, knock on wood! I’ve of course made some radish butter with my first harvest, but I also wanted to make some kind of radish salad. I decided on a cold noodle salad because I didn’t think my lettuce was quite big enough to start cutting. Asian salad recipes often use noodles in addition to or in place of lettuce. If you use a noodle like the suggested mung bean noodles, you’ll get a good amount of iron and healthier carbohydrates compared to something like spaghetti. In addition to radishes, I have a TON of mint along the back wall of our house. I don’t think mint is typically thought of as a salad ingredient, but I LOVE it in spring rolls and Thai salads so I immediately decided to try it in the radish salad. I really loved the combination of its sweetness with the slightly peppery radishes. Now, if you’re interested in other salads with mint, you HAVE to try my strawberry mint salad. I made it for dinner last night and we all had seconds! It’s a great side salad recipe but it’s also the favorite healthy dessert recipe in my cooking classes. Okay, back on topic. This Asian noodle salad is also a good side salad, or it can make a simple lunch. You can also adjust the flavor slightly based on your preferences. The recipe below is for a sesame noodle salad, if you want a peanut noodle salad, use peanut oil and sprinkle with chopped peanuts instead of sesame seeds. It’s amazing how just one ingredient can change an entire dish! Our CSA box will be small starting out, but I’m pretty sure there will be radishes! I’m excited to start bringing this salad with me for lunches. I’m afraid I haven’t been doing a good job of eating regularly in the midst of all this stress. Hopefully I can start remembering to bring lunch with me. I actually had my first Jack in the Box meal in four years last week. The first few bites tasted amazing, but by the end, I felt pretty lousing. No more fast food diets! As always, Asian ingredients are cheaper at an Asian grocery store. If you don’t have black vinegar, you can substitute balsamic vinegar. But know that for the future, you can get quality Chinese black vinegar at a much more affordable price than quality balsamic vinegar. Oh, and if you want more Asian/Oriental salad recipes, you definitely have to check out my healthy version of an Oriental chicken salad and my cranberry cabbage slaw. So I have a weekly CSA box to look forward to picking up and cooking from every week. What do you look forward to in the midst of hard times? 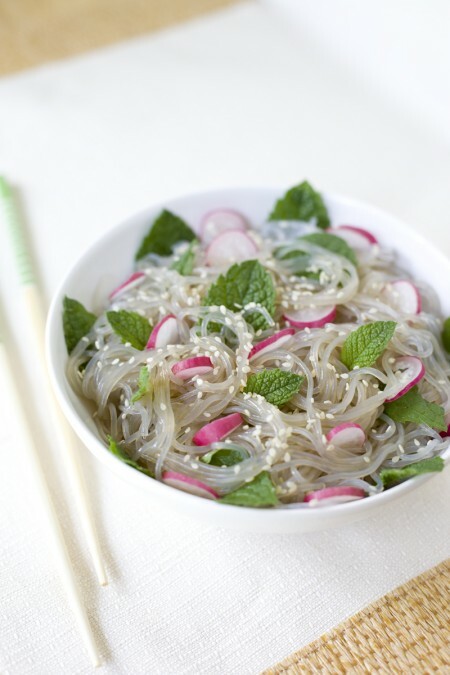 A cold noodle salad with mint and radishes fresh from the garden in an Asian dressing, perfect for a side dish or easy lunch. 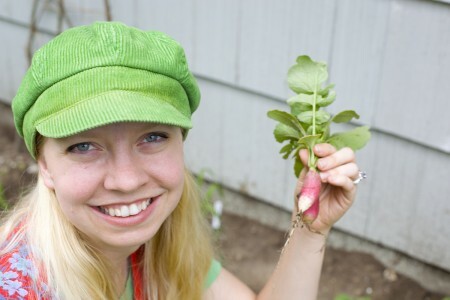 Remove roots and leaves from the radishes and discard. Wash and thinly slice the radishes. Rinse the mint leaves (if needed) and tear into small pieces. Divide the noodles among 4 small bowls (for a side dish) or two bowls (for a main dish). Whisk together soy sauce, sesame oil and vinegar and pour over noodles. 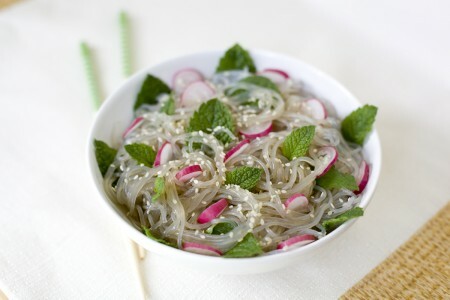 Arrange radish slices and mint in each bowl of noodles and sprinkle with sesame seeds. To eat, mix well to make sure everything is well coated in dressing. 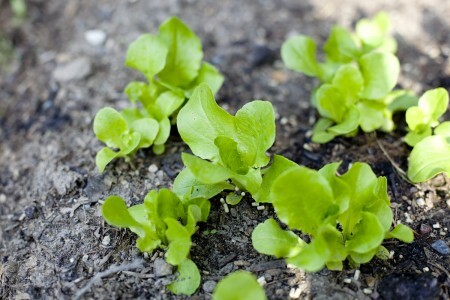 Approximate cost/serving: By growing the radishes and mint myself, this is a CHEAP salad! Even if you buy the radishes, they're very affordable in season. This cost me just 80 cents to make 4 side dishes, so only 20 cents a serving! Vegetarian/Gluten Free: This is vegetarian and vegan. Make sure your mung bean noodles are just mung bean flour and water to keep this gluten free, as well as using gluten free tamari or soy sauce. I’m so sorry to hear about your awful week. I’m hoping things get better for you soon. Thanks Zoe. Things are still tough but my attitude is way better! I am so sorry for everything that has happened. I have been through the forcing of grandparents into assisted living and losing the kitty to FIP, so I definitely know where you are coming from. The salad looks good. I may have to try even through I am not really into radishes. They always seem so “spicy”, so I usually steer clear, but may make for a potluck so I can try! Hang in there! Hi Diana – thanks for this recipe. 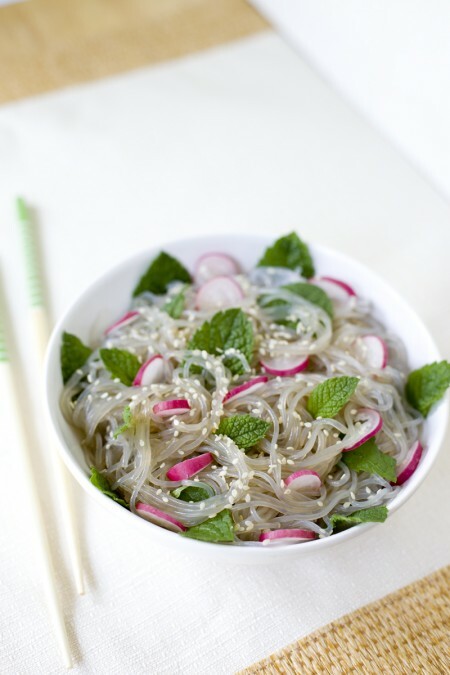 I have some leftover Korean sweet potato noodles, I could use them to make this recipe!! I love hearing and seeing your posts about your CSA It’s a highlight with me as well because of you!